Immunology at a Glance provides a user-friendly overview of the body s defence mechanisms. Ideal from day one of a medical, biomedical or life science course, the text begins with a basic overview of both adaptive and innate immunity, before progressing to applied immunological concepts, which look at what happens when things go wrong, and how, in clinical medicine, each body system can be affected by immunity. Each double-page spread corresponds to a typical lecture and diagrammatically summarises core concepts in immunology, through accessible schematic diagrams on left-hand pages, with key points concisely summarised on the right-hand page. There are also self-assessment essay questions so you can test your knowledge. 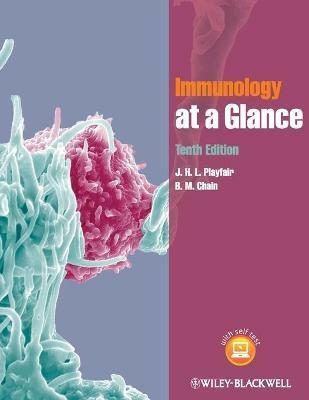 New for this 10th edition: * Thoroughly updated and reorganised chapters offer greater clarity and easier understanding for those new to the subject * New chapters on cytokine receptors and Immunology in the Laboratory * A completely re-written section on autoimmunity * A brand new companion website featuring self-assessment questions and PowerPoint slides of images from the book, ideal for teaching and revision at www.ataglanceseries.com/immunology Immunology at a Glance is the ideal companion for anyone about to start a new course in immunology and will appeal to medical and biomedical science students. Perfect for exam preparation, it provides the concepts and frameworks you need to succeed in your exam. Immunology at a Glance provides a user-friendly overview of the body's defence mechanisms. Ideal from day one of a medical, biomedical or life science course, the text begins with a basic overview of both adaptive and innate immunity, before progressing to applied immunological concepts, which look at what happens when things go wrong, and how, in clinical medicine, each body system can be affected by immunity. Each double-page spread corresponds to a typical lecture and diagrammatically summarises core concepts in immunology, through accessible schematic diagrams on left-hand pages, with key points concisely summarised on the right-hand page. There are also self-assessment essay questions so you can test your knowledge. Immunology at a Glance is the ideal companion for anyone about to start a new course in immunology and will appeal to medical and biomedical science students. Perfect for exam preparation, it provides the concepts and frameworks you need to succeed in your exam. Professor John H L Playfair, MB BChir PhD DSc, Emeritus Professor of Immunology, University College London, UK. Professor Benjamin M Chain BA, PhD, FRCPath, Professor of Immunology and Head of Department at the Windeyer Institute of Medical Sciences, University College London, UK.